The sun goes down behind the thunderstorm that tried to drown us at Terlingua Creek. The layers of mountains and the color palette made this image my favorite of the trip. 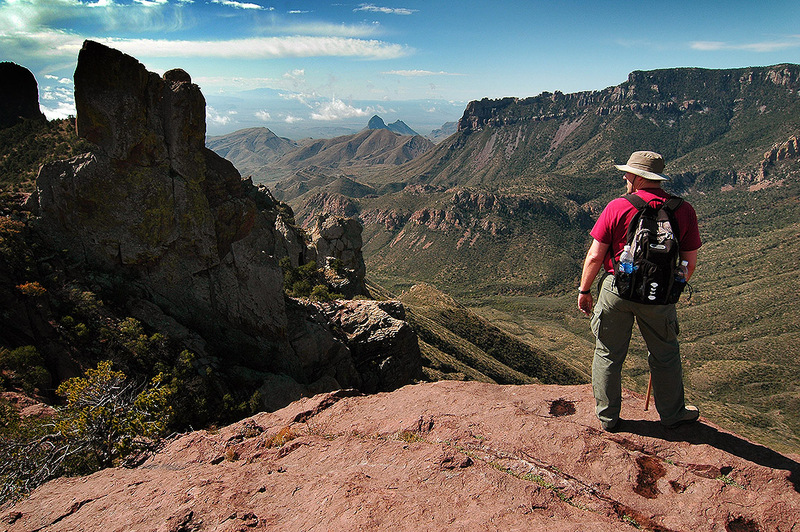 David Martin hikes the Lost Mine trail in the Chisos Mountains of Big Bend National Park, Texas. David Martin and I had been looking at the Big Bend National Park area of southwest Texas for a long time, and finally made ourselves go. The park service cautions that the week of spring break is the most crowded at Big Bend, but our plan was to arrive just as the crowds were headed home, and that worked pretty well. The author poses in front of Spiral Diner. 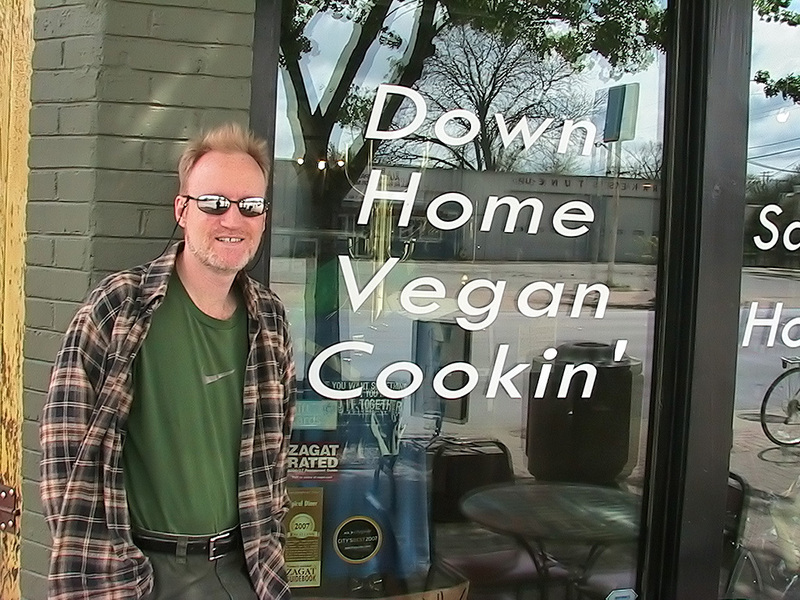 We started our trip by timing our drive such that we were in Fort Worth, Texas, in time for lunch at David’s favorite restaurant, the Spiral Diner, a vegan and vegetarian café. By late afternoon, we were at Monahans Sandhills State Park, where we hiked around for a little while. The light was nice, and it made a few decent images. 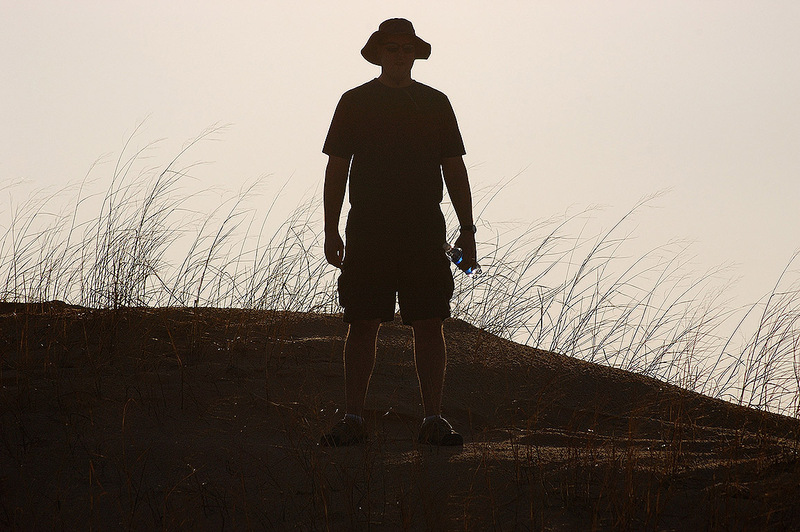 David is silhouetted against the afternoon sky at Monahans Sandhills State Park, Texas. 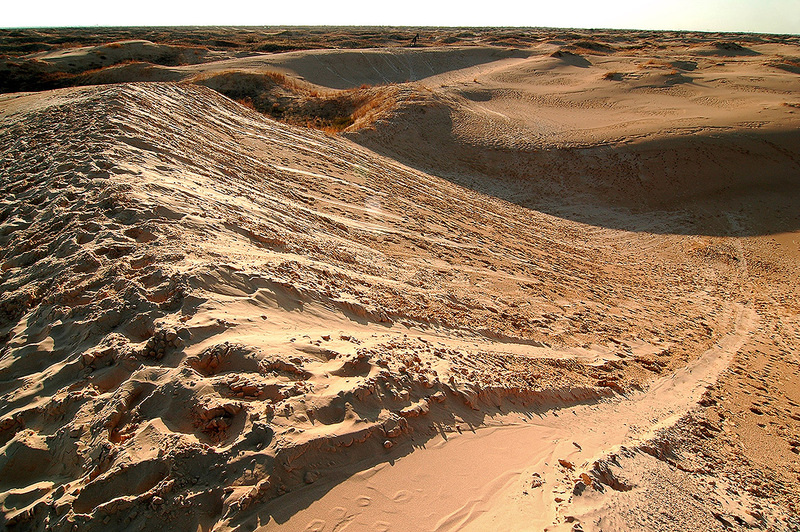 Sled marks lead down a sand dune at Monahans Sandhills State Park. 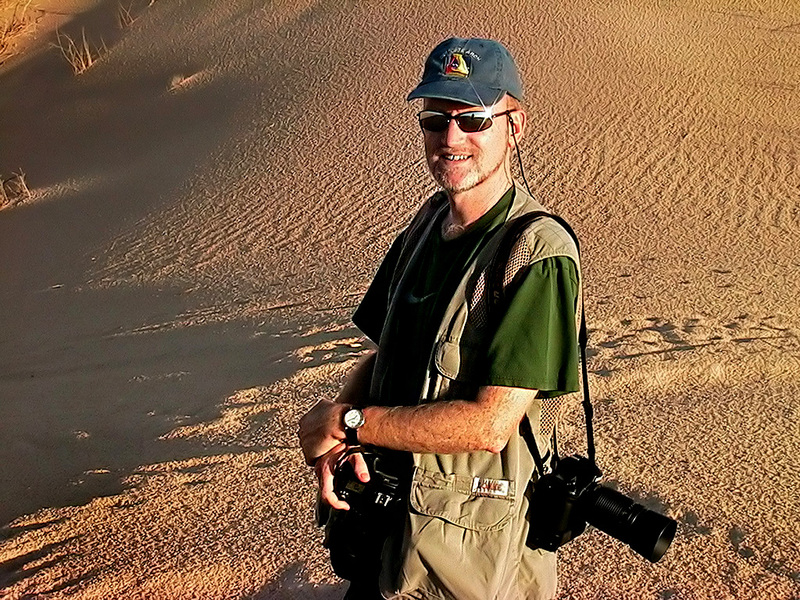 The author smiles as the sun goes down at Monahans Sandhills State Park, Texas. 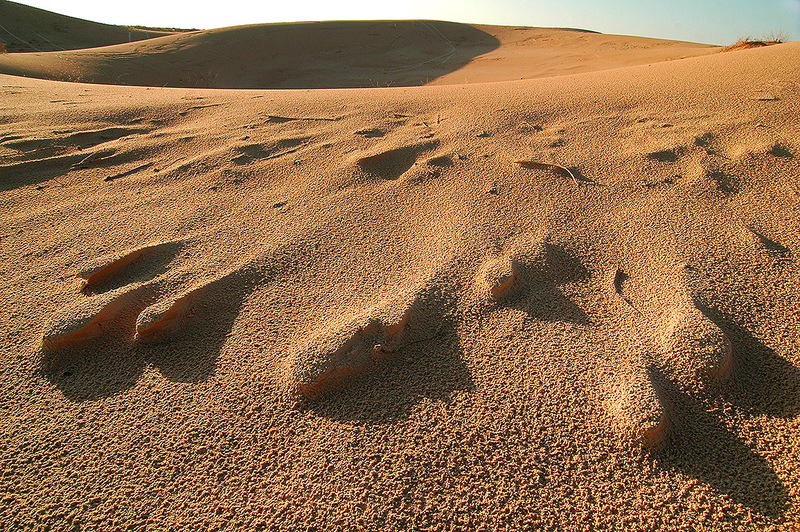 Sand takes on unusual forms at Monahans Sandhills State Park. 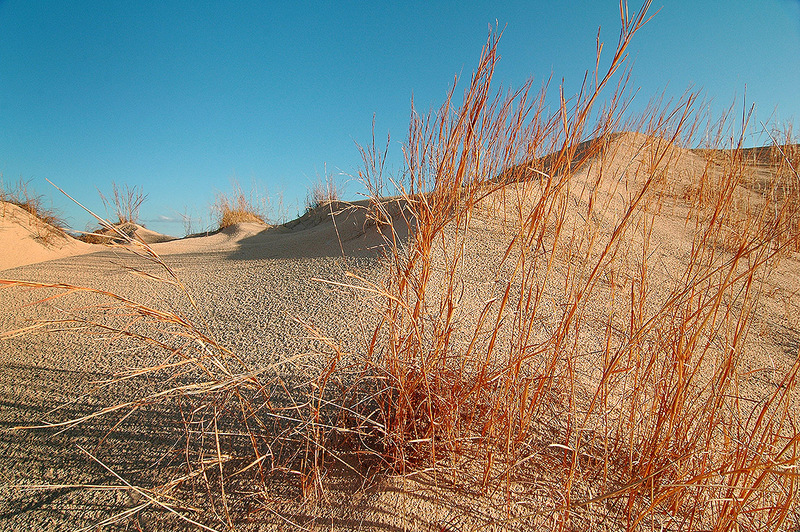 Red grasses cling to the sand at Monahans Sandhills State Park. 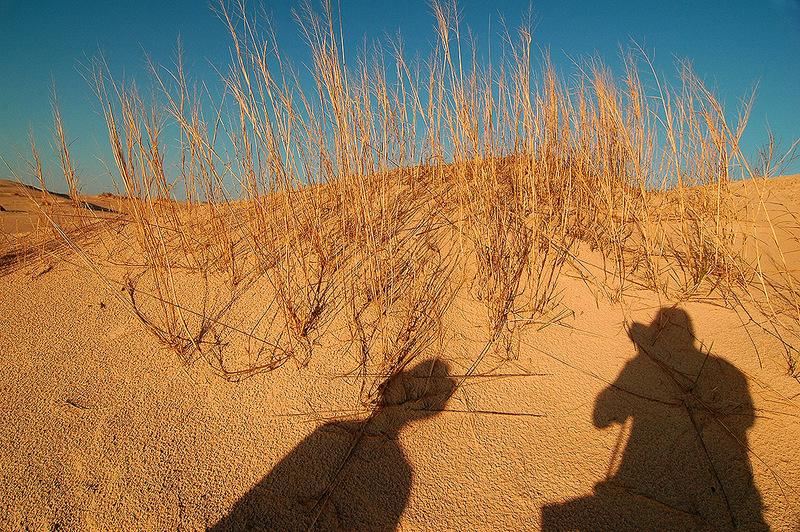 Our shadows appear on the ground as the afternoon grows late at Monahans Sandhills State Park. 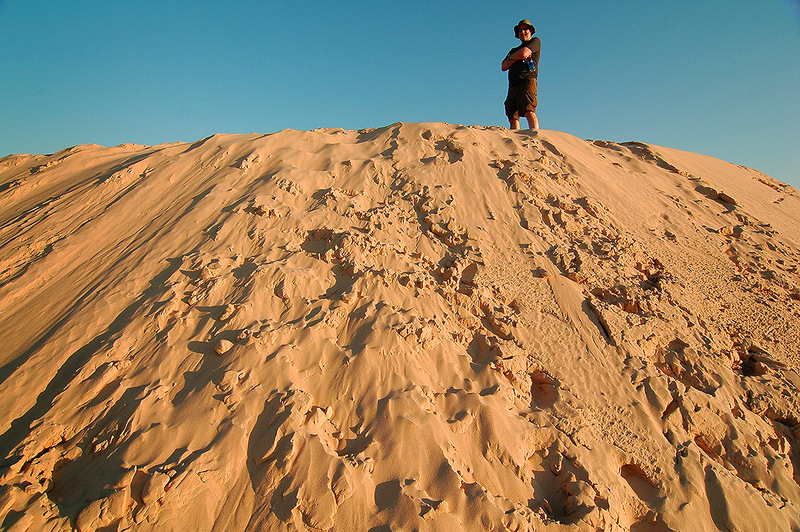 David poses at the top of a popular sledding hill at Monahans Sandhills State Park. 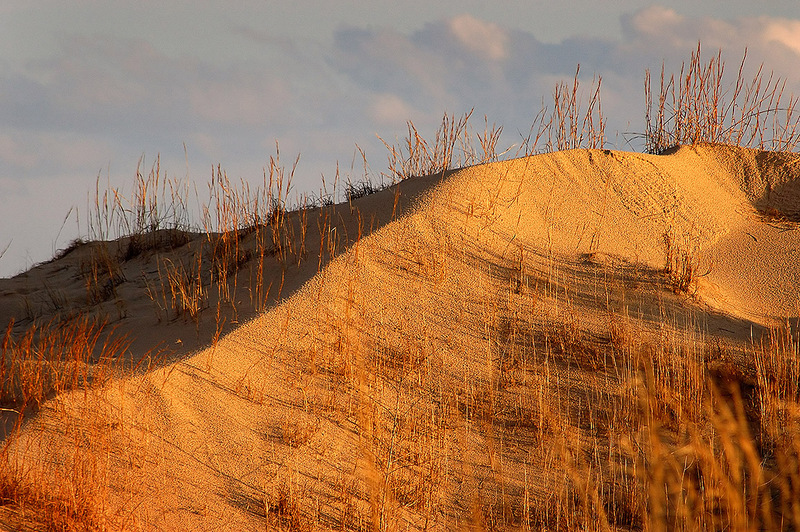 A ridge shines in maturing afternoon light at Monahans Sandhills State Park. 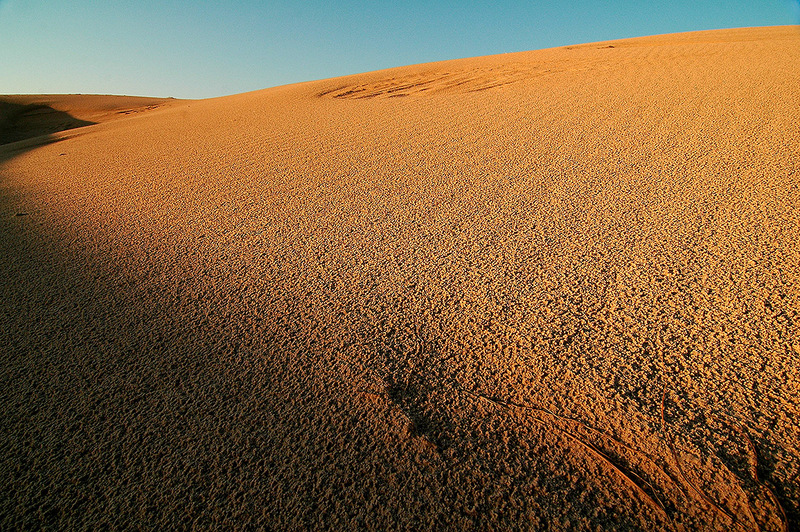 The golden hour arrives at Monahans Sandhills State Park. 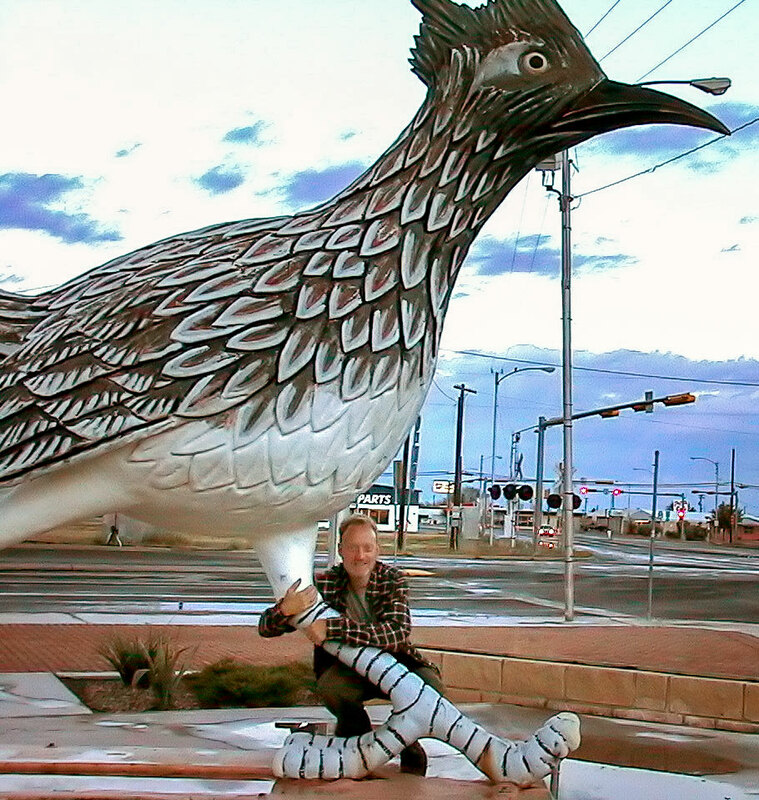 Your host poses with Paisano Pete, a huge roadrunner statue, in Fort Stockton, Texas. We arrived at Big Bend to alternating clear then cloudy then clear again skies. 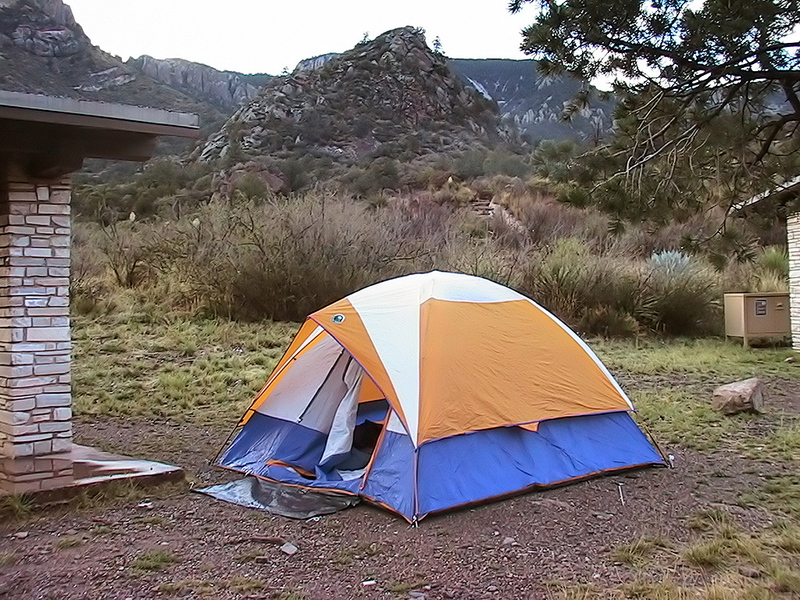 We found a site in the Chisos Mountains Campground. We hiked The Window trail to The Window, an impassable pour-off that affords excellent views of the western half of the park. 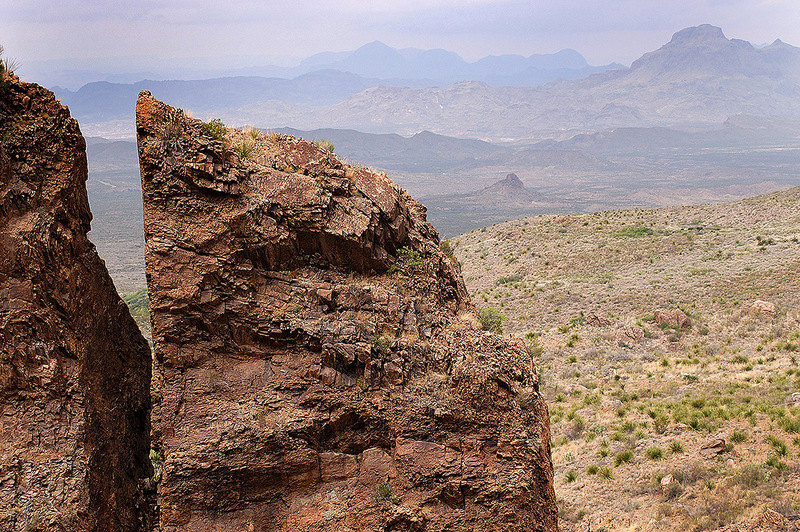 This is the extraordinary view at the end of The Window trail at Big Bend National Park. 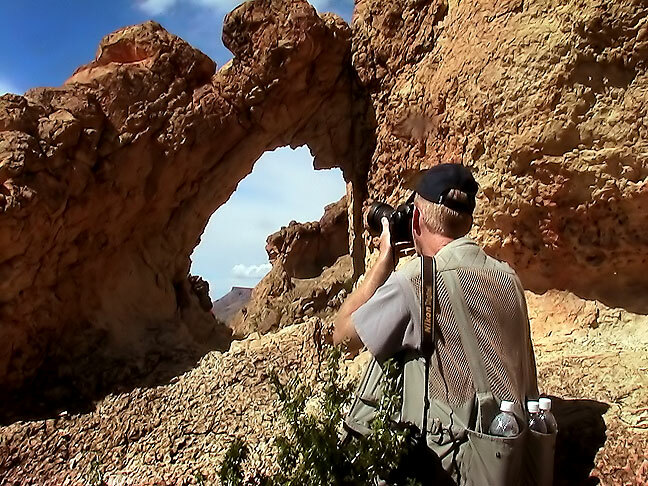 Your host poses for an image at the end of The Window trail at Big Bend National Park. David rests at the end of The Window trail. Impassable pour-off at the end of the Window trail. This is another beautiful view of The Window trail. 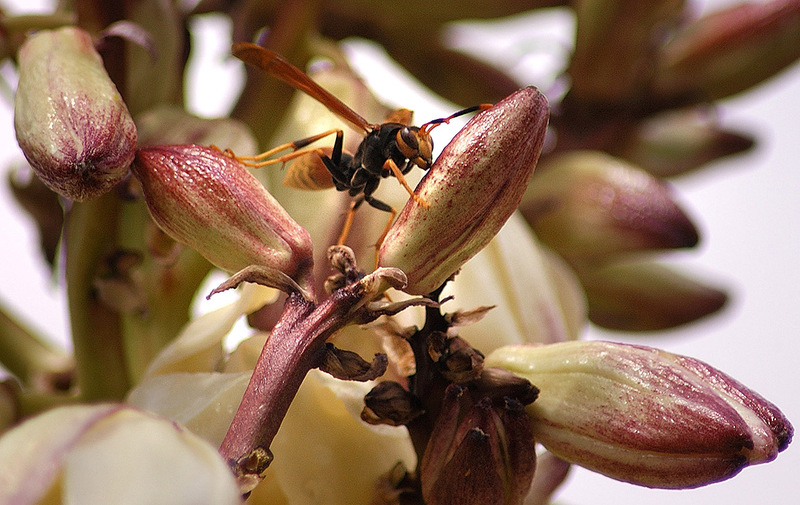 A wasp harvests a flower on The Window trail at Big Bend. 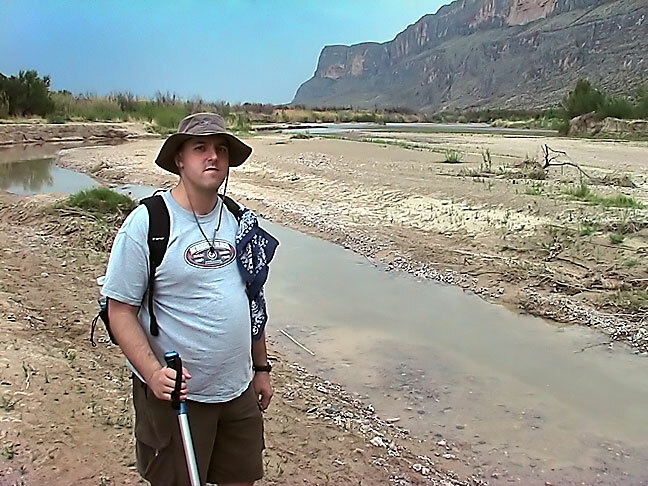 David prepares to hike Santa Elena Canyon. We drove to the southwest end of the park to hike Santa Elena Canyon of the Rio Grande. It had rained on us briefly earlier in the day, but by the time we were there, all the rain appeared to have moved to our north. 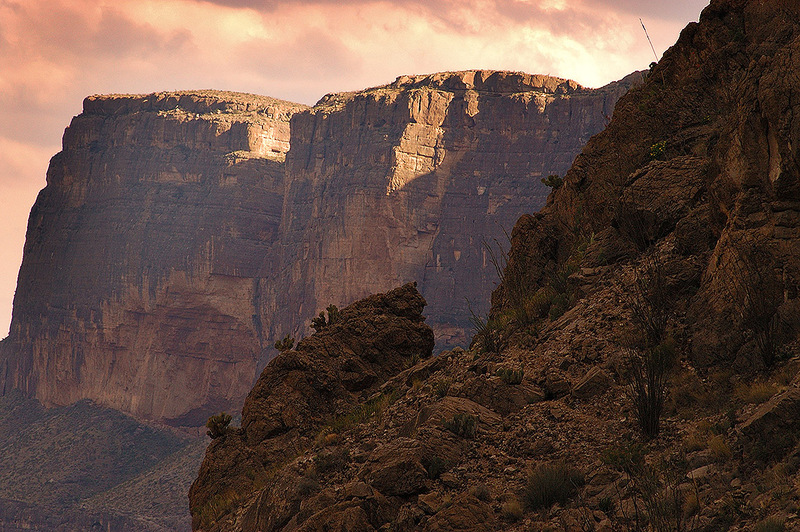 Santa Elena Canyon is a towering river cut created by the Rio Grande River. Much of the way into the mile-long in-and-out trail at Santa Elena Canyon at Big Bend, I looked back to make this gorgeous view of the cliffs surrounding the Rio Grande. 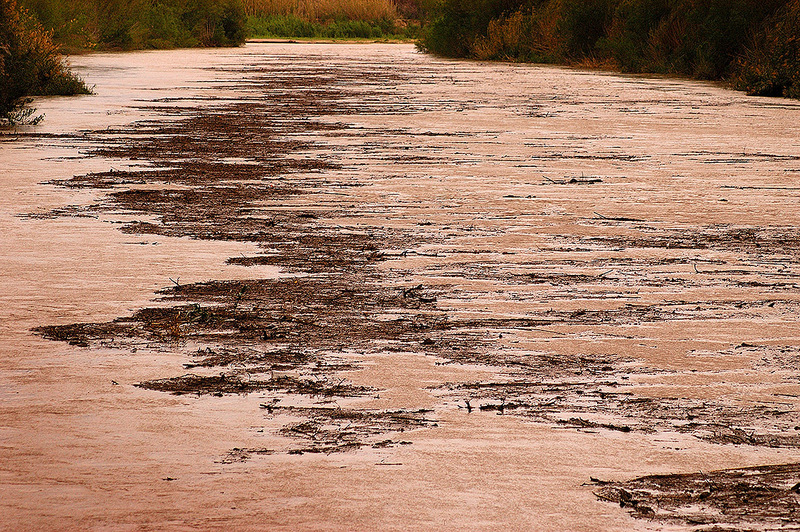 As we hiked Santa Elena Canyon, we noticed the Rio Grand suddenly started to show much more floating debris that before. 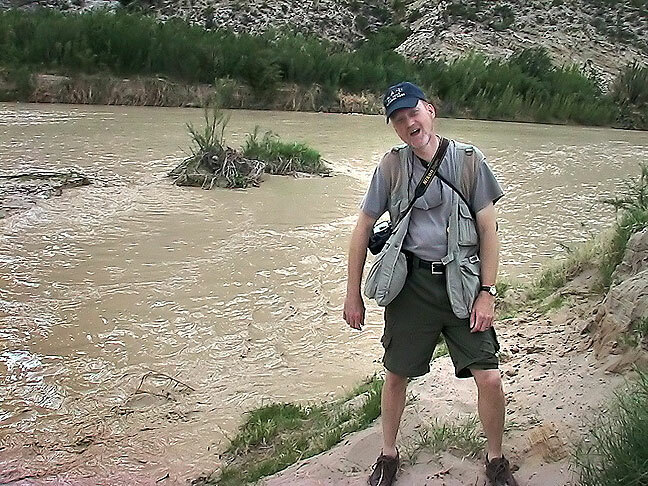 It was a beautiful hike, but as we moved upstream along the canyon, I noticed that the water in the Rio Grande was rapidly getting dirtier, bringing downstream more and more mud, sticks, oil and garbage. Walking back toward the trail head, the river and the mountains looked beautiful. 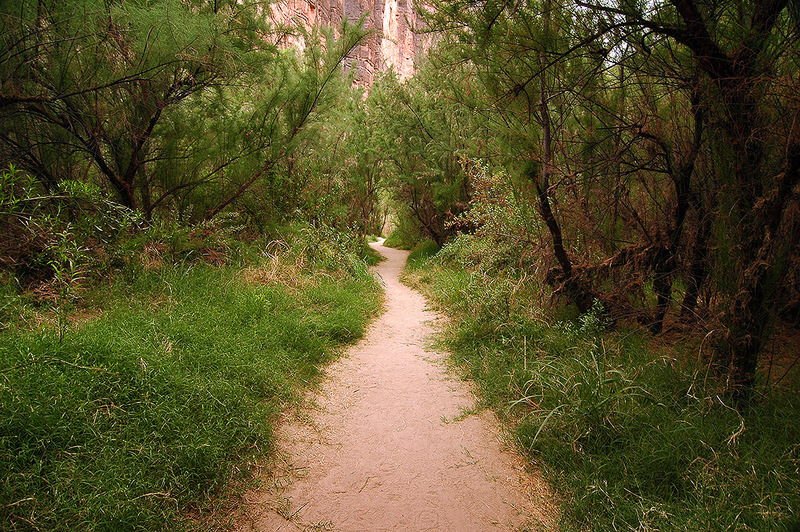 The Santa Elena trail leads through this willowy bottom before it crosses Terlingua Creek. By the time we got back to the vicinity of the trailhead, I noticed two people who appeared to be wading in the Rio Grande. I asked David, “What the hell are they doing in the water?” We continued along this path towards the trailhead. Within another hundred yards we discovered why the people ahead of us were in the water. The open wash we had crossed on the way in wasn’t Rio Grande backwash after all. 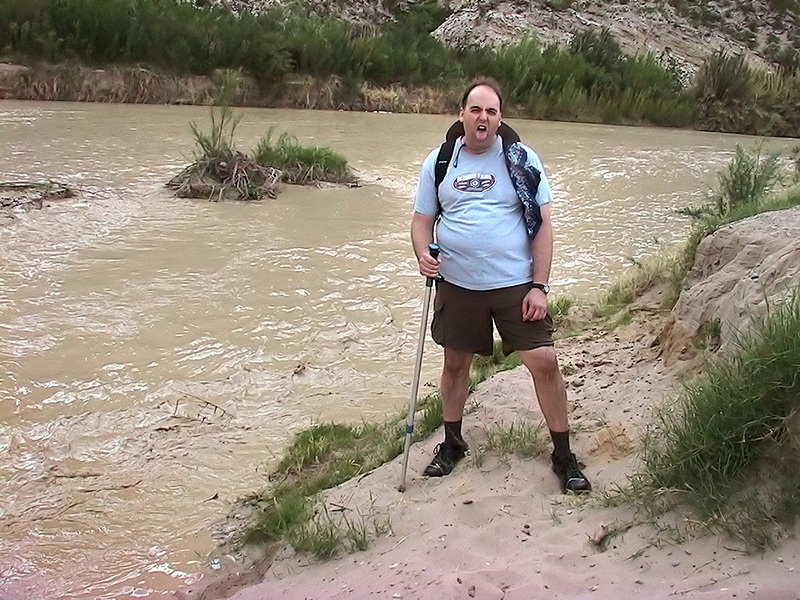 It was Terlingua Creek, and it had flash flooded behind us while we were hiking Santa Elena. A tremendous volume of debris flows down the Rio Grand in Santa Elena Canyon. David and I pondered waiting to see if it would go down, but my feeling was that with every minute that passed, the chances increased that we would be stranded. I zipped off the legs of my convertible hiking pants to make them into shorts, and took off my shoes and socks so I could stow my socks. I put my shoes back on, hoping they would provide more traction as we forded. I usually carry my cameras shouldered one on each side, but for climbing and scrambling, I carry them cross-slung, so they can’t fall off and don’t get in my way. I did so this time, and stashed my pants legs and socks in vest pockets. David extended his hiking pole (actually, it was my wife Abby’s, which he had borrowed), so he could use it to probe for the bottom. Even though I don’t care for the water at all, at this point I strode right in. I decided not to waste any time, since the raging water might be worse in five or ten minutes. 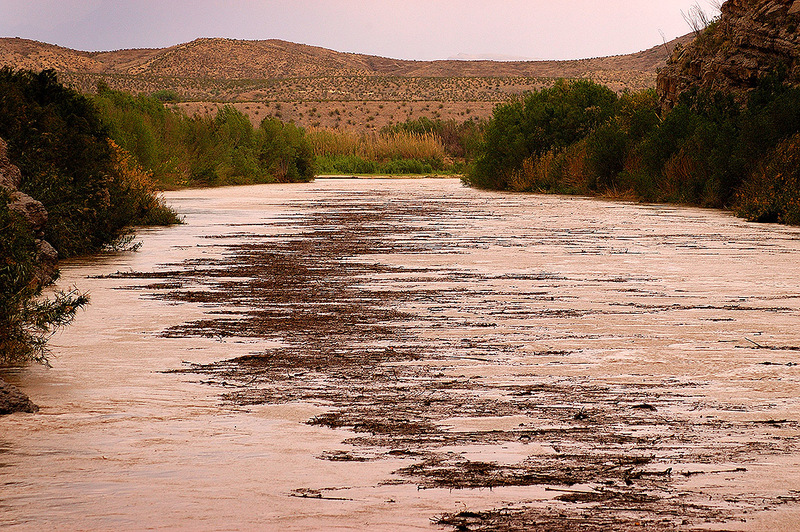 David expressed his dislike for crossing Terlingua Creek during a flash flood. At its present level, we decided, at least we had some idea how deep it would be. The pressure was strong against our legs, as we crossed to a gravel island. From that point, we probed up and down for the shallowest spot. Finding it all about the same, we picked a place close to the bank, since it would limit our exposure. At its deepest, it was right at my crotch. I planted one foot and dug it in, then the other, until I was across. David threw me the hiking pole so I could anchor him, and he got across. Our hiking shoes were socked all the way through after The Crossing. 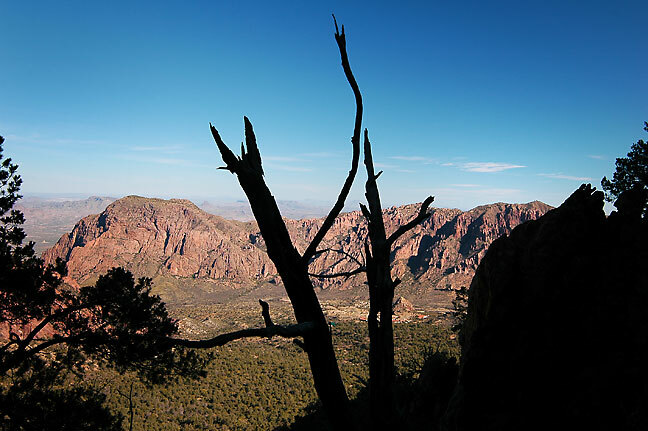 In the morning, we hiked the Lost Mine Trail in the Chisos Mountains. It was somewhat strenuous, with some switchbacks. It was particularly nice in the clearing morning clouds. It was surprisingly crowded, particularly given its difficulty. 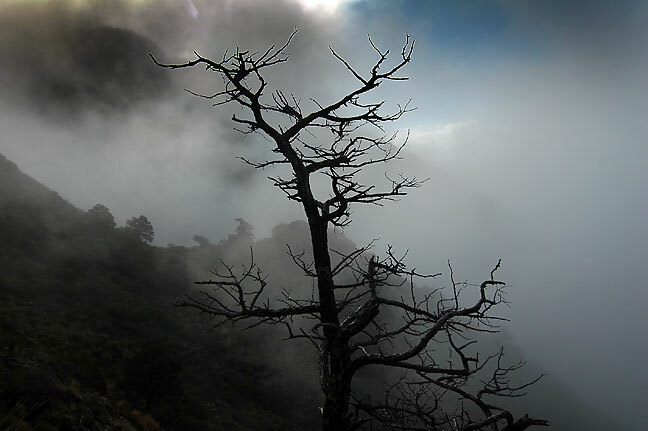 Crossing a saddle about three quarters of the way up the Lost Mine trail, we spotted these low morning clouds. 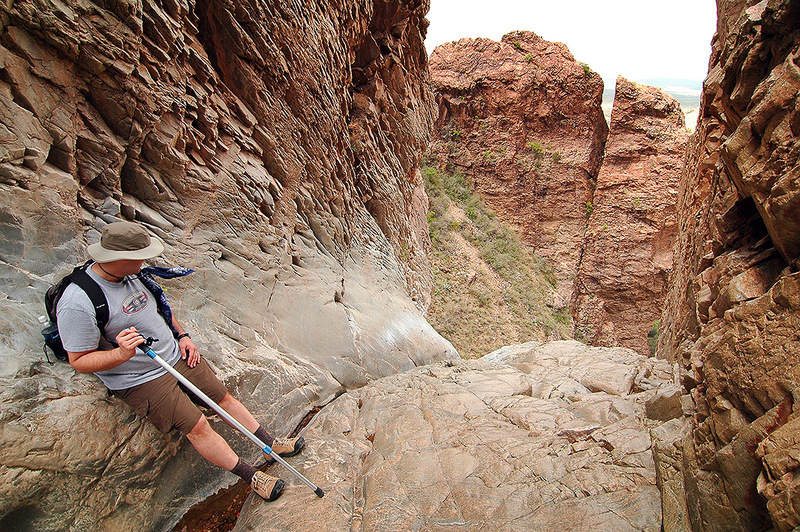 David hikes at the top of the Lost Mine trail. 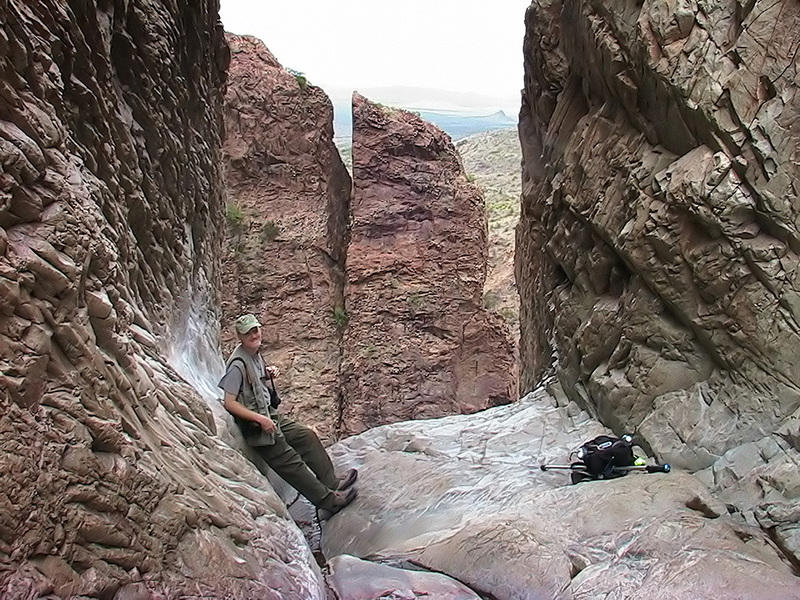 Your host photographs an unnamed conglomerate natural arch in The Chimneys section of Big Bend. In the afternoon, we hiked to the Chimneys in the western part of the park. 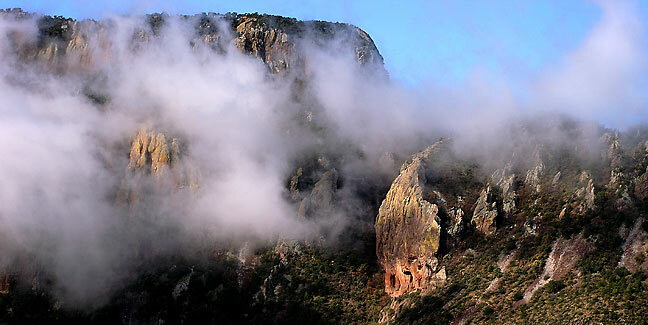 Listed as primitive on the maps, it was an easy, level three miles to the Chimney formation. There we saw a granary, a pictograph, and a natural arch. Cactus blossoms, The Chimneys trail, Big Bend. 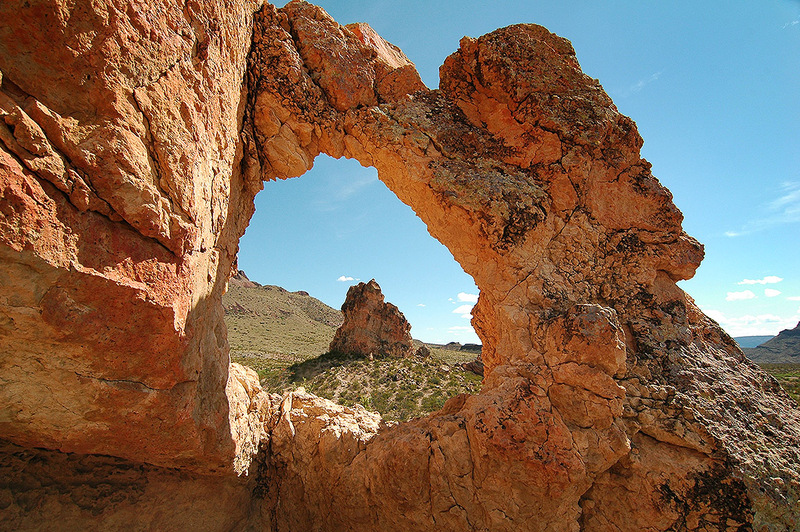 This is an unnamed conglomerate arch at The Chimneys in Big Bend National Park. It rained all night, sometimes hard. We stayed dry, thanks to good campsite selection and good tent placement. This is our camp site after a night of rain. We stayed dry thanks to pitching on a gravel slope. 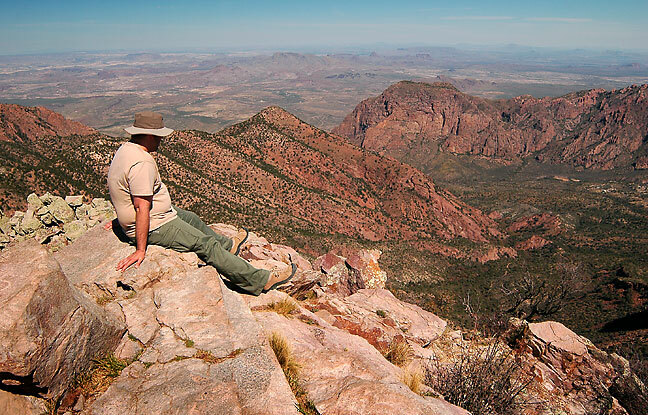 This view is from about halfway up the Emory Peak trail, Chisos Mountains, Big Bend. We hiked to the park high point, Emory Peak (7825 feet), without too much fuss. 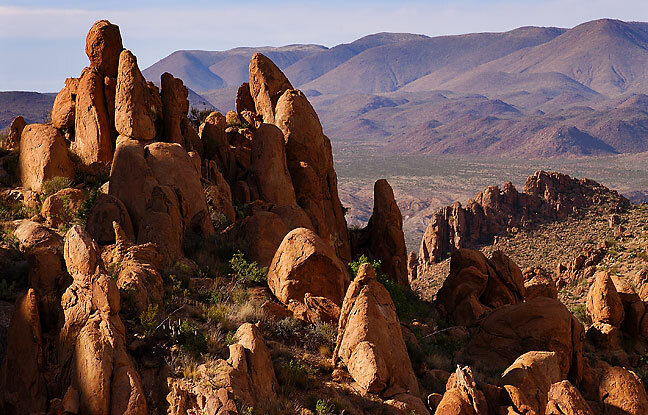 The last mile is rough and primitive, and the last 100 feet is strictly bouldering. Nice views, clear sky. David watched swallows flying for half an hour or more. 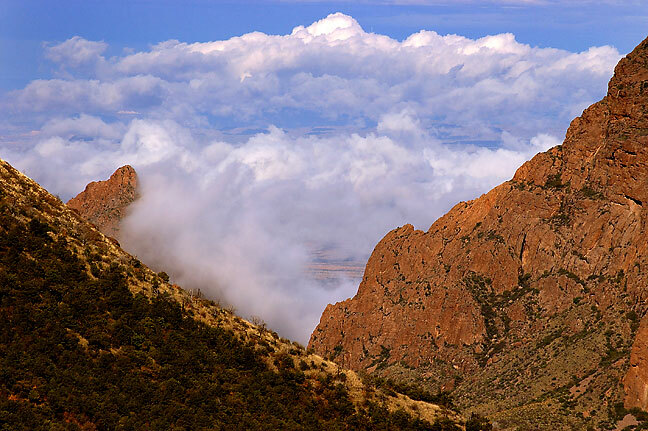 This is a view from Emory Peak looking southeast. 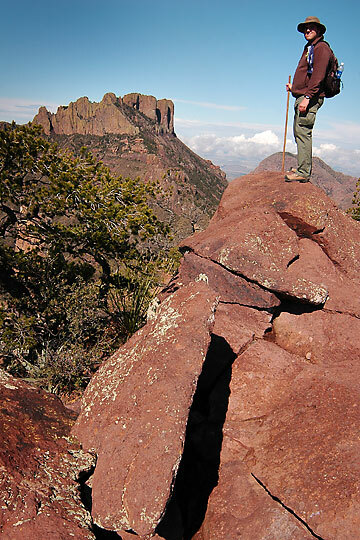 David sits atop Emory Peak, the high point of Big Bend; the last eighth of a mile is strictly boulder-climbing. 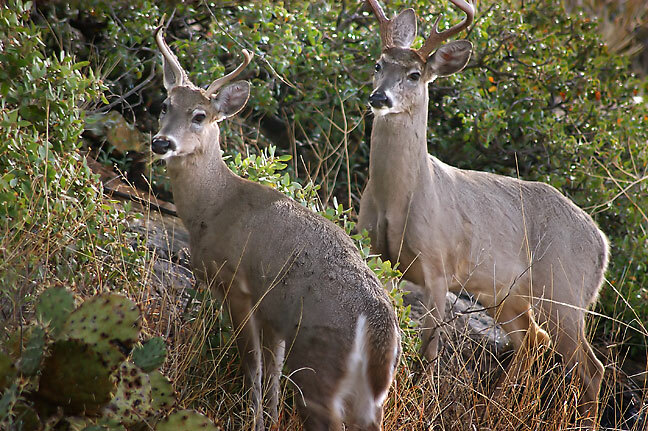 Deer on the Emory Peak trail, Chisos basin, Big Bend. Blue Jay, Emory Peak trail, Chisos Mountains, Big Bend. After lunch, we drove to the Grapevine Hills, in the central area of the park, where we hiked a level, one mile trail to a balanced rock. 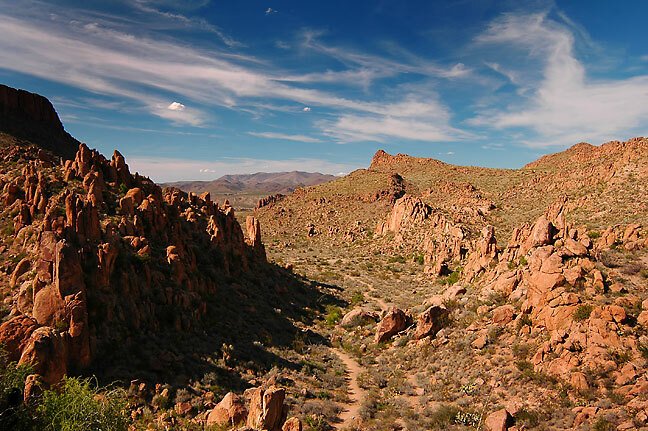 The trail was the most beautiful we have seen at Big Bend. 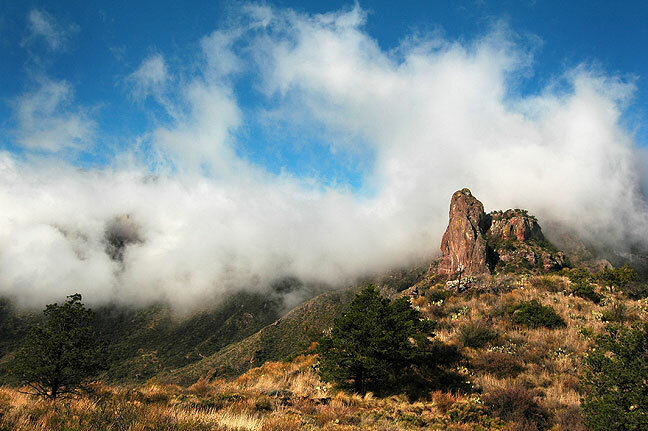 Grapevine Hills, Big Bend National Park. 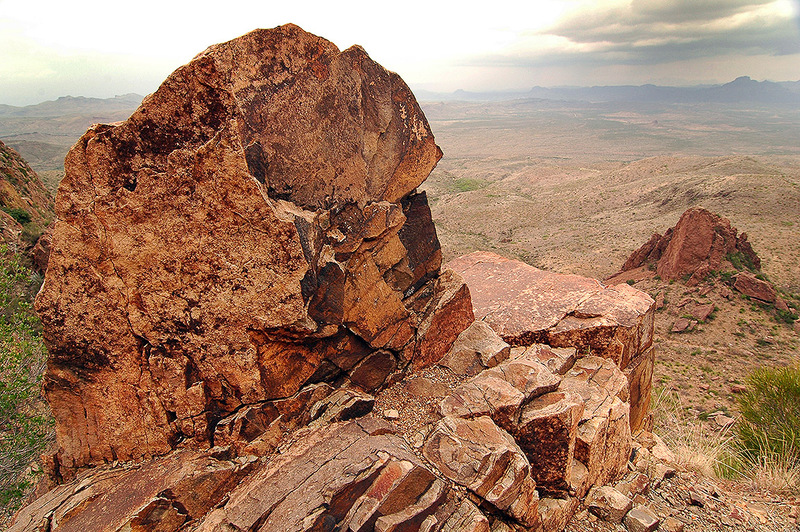 The Grapevine Hills trail leads to this “balanced rock,” Big Bend National Park. David climbs on formations near “balanced rock,” Big Bend National Park. 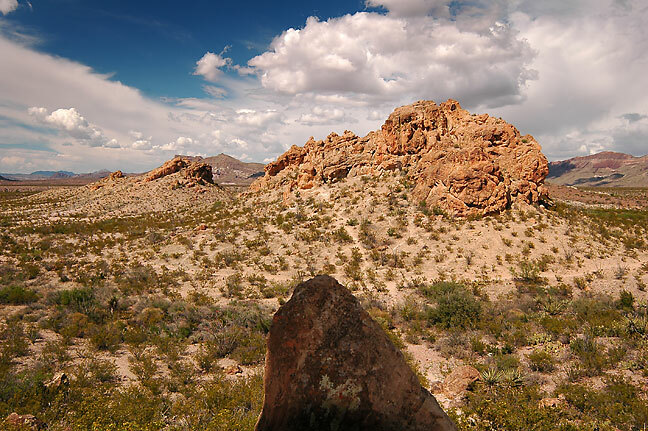 Grapevine Hills near “balanced rock,” looking southeast, Big Bend. Formation in the Grapevine Hills, Big Bend. I think this Grapevine Hills formation looks like a dog. This is a rendition of the boulder field in the Grapevine Hills, this one in black-and-white; I feel this rendering is closer to the open, high country light capture by photographers like Ansel Adams. 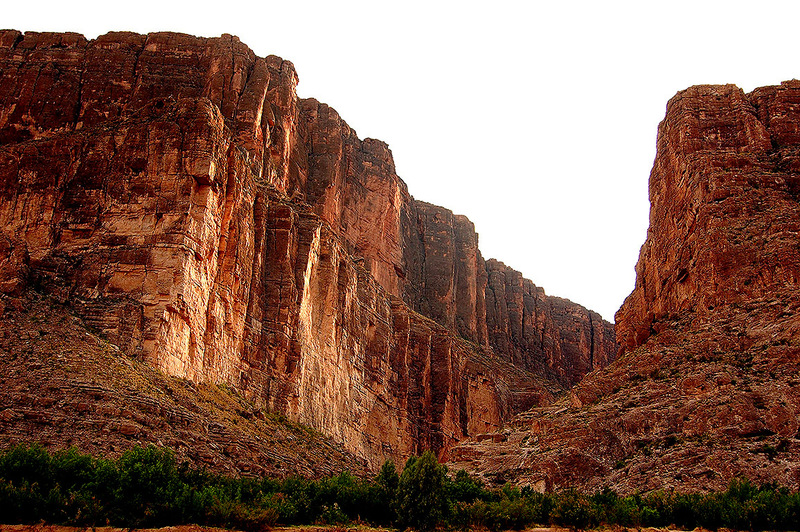 In the evening, we drove to the park low point, Boquillas Canyon of the Rio Grande. 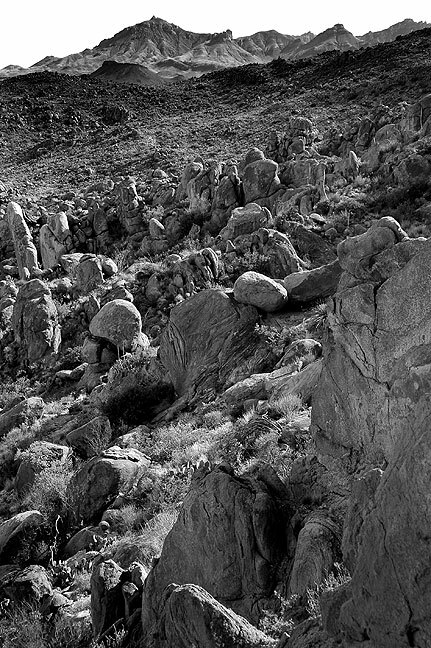 Stones in wash, western Big Bend National Park. 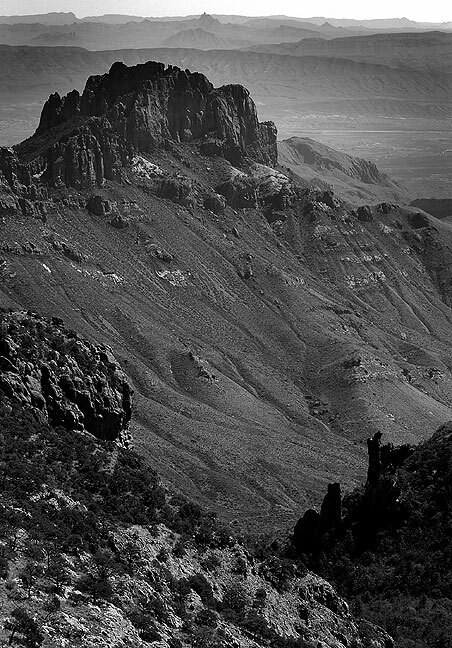 The Mules Ears, Big Bend. Yucca flowers, Chisos basin, Big Bend National Park. 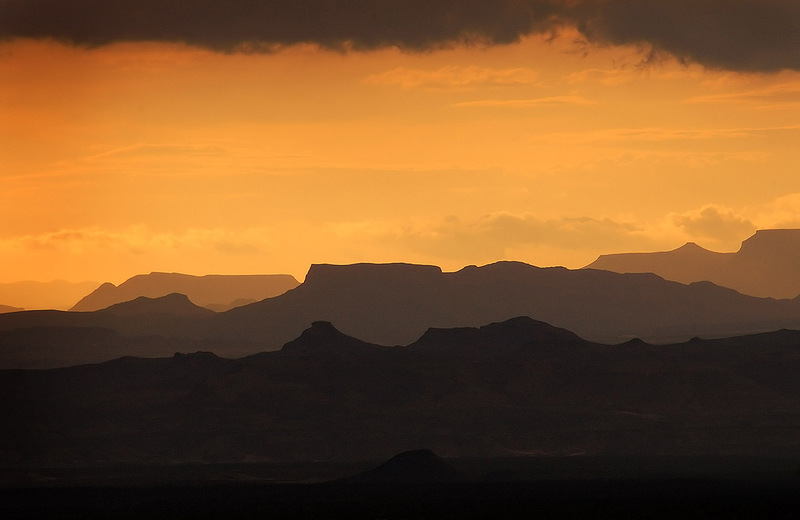 Sunset, Chisos basin, Big Bend National Park. Texas Bluebonnets, Big Bend National Park. 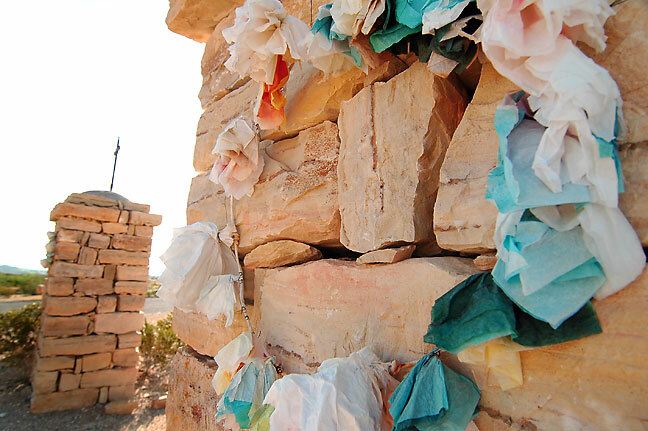 Donation “box,” Boquillas Canyon, Big Bend. Cliff and moon, Boquillas Canyon, Big Bend. Rio Grande, Boquillas Canyon, Big Bend. Cactus and cliffs, Boquillas Canyon, Big Bend. Sunset, Boquillas Canyon, Big Bend. Desert shrub, sunset, Boquillas Canyon, Big Bend. 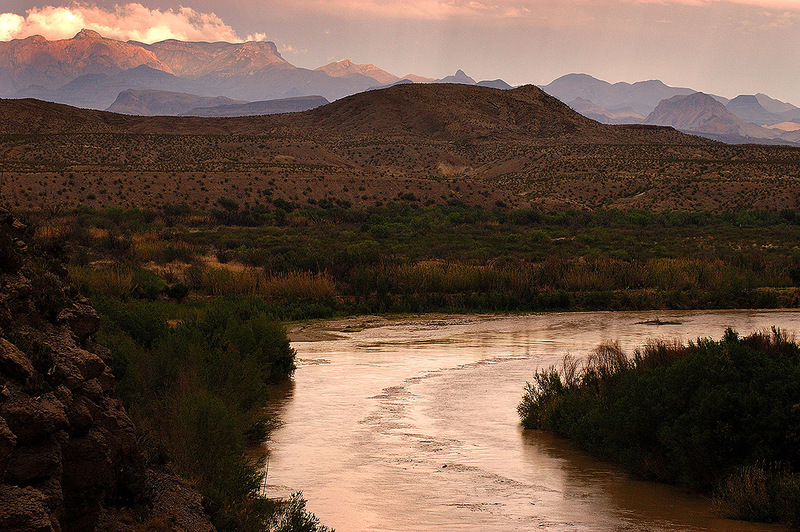 Rio Grande after sunset, Boquillas Canyon, Big Bend. Broke camp early and headed north. Our first stop was Terlingua, which advertised itself as a ghost town. Sadly, we found it to be highly commercialized, with the exception of the beautiful Spanish cemetery. 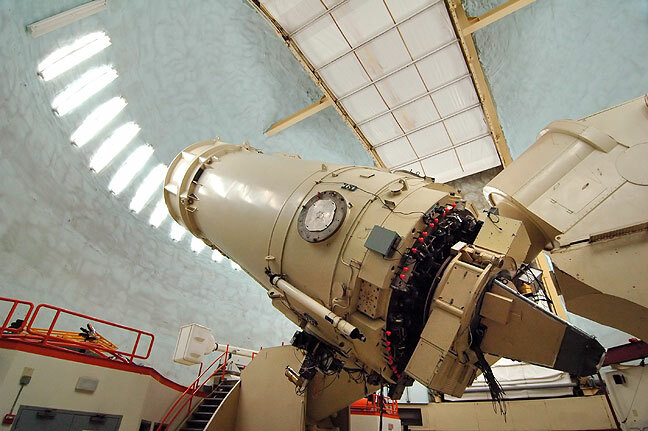 Large refractory telescope, McDonald Observatory. 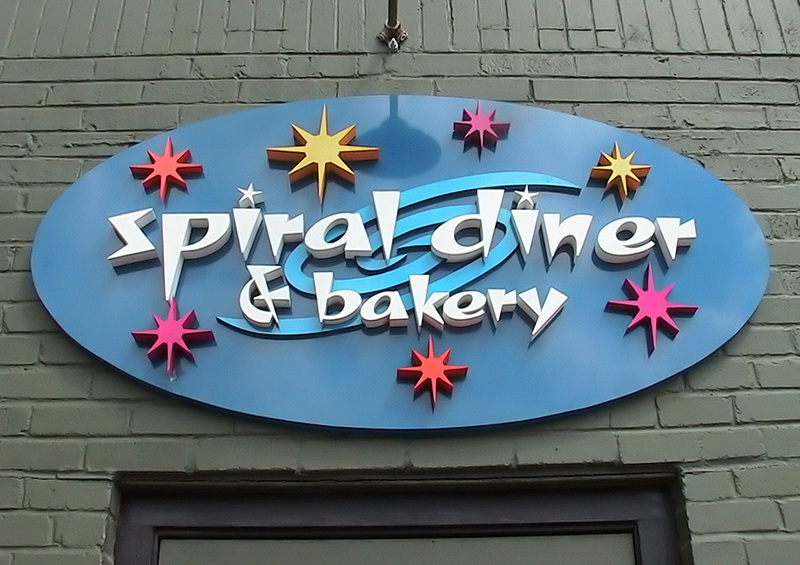 The Spiral Diner and Bakery in Fort Worth, Texas has some of the best vegetarian fare I have ever enjoyed. 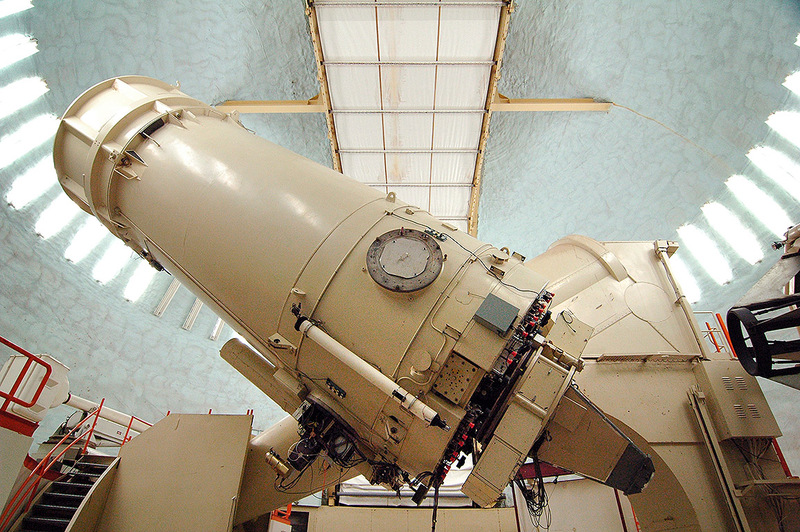 The rest of the day we spent at the McDonald Observatory near Fort Davis, Texas, which we both found interesting. It was an excellent end to another excellent hiking trip. To cap it all off, we timed our return to allow us to again eat at Spiral Diner.